Knowledge of archiving web-based content is an increasingly important skill for those working with and interested in historical documents. 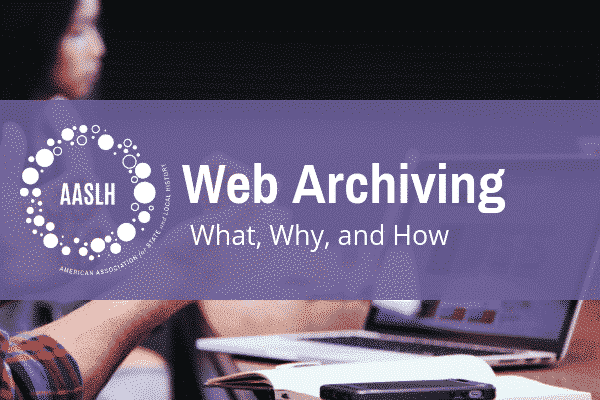 This webinar will include an overview of web archiving, and delve into collection development, terminology, processes, tools, workflows, and access methods. Specific use cases will be spotlighted, such as archiving online exhibits and social media, to give attendees some practical examples to take back to their institutions. Closed captioning available upon advanced notice. Please contact flammia@aaslh.org for more information. Jillian Lohndorf joined Archive-It in 2016. Previously, she worked in the Archives and Special Collections at DePaul University and Rotary International, and as Web Services Librarian for The Chicago School of Professional Psychology. She holds a Master of Science in Library and Information Science from the University of Illinois at Urbana-Champaign.